In music, fashion, food and art there’s pop cultural phenomena so ubiquitous and so pervasive that I feel duty bound to write about them. Or hate on ’em.. In music, it’s Kanye West. He’s everywhere… Why? Make it stop, please! I’m tired. Doesn’t he get tired of himself? Megalomaniacs rarely do. Sadly, the more we hate on him, the harder he comes back at us. In fashion it’s currently Birkenstocks. Frankly, I thought this one was going to die out with the summer but now I’m seeing Birkenstocks with socks, just in time for fall. Don’t ask me where this came from, but it’s a THING….and people love to hate on it (for good reason). Oh food, the food! Where do I begin? Cupcakes? No, they are so over. Macarons? Who really hates on Macarons? Anyone? (actually, my husband does, he calls them “air cookies”). Bacon? Kale? Avocado toast? (specifically Avocado toast from Gitane, for the record no hate from me on Gitane) Green juice? Take your pick! We can all spot a food cliche quicker than we can order a quinoa beet salad from the “farm to the table”… I’m guilty of perpetuating all of these. But if I had to pick, one? It’s gotta be the Cronut. And then there’s art. There are some train wrecks you see coming that are so obvious they don’t need warning let alone commentary. This is why I resisted talking about Banksy…until today. We are now officially at the point where the train wreck occurred and now someone’s looting the crash site. It’s such a mess I can’t leave it alone. For those of you living under a rock or outside New York City, the infamous British street artist Banksy has taken up residence in NYC for a month, and his presence has caused quite a stir in the 5 Burroughs (though I don’t think he’s hit up Long Island yet). Since I’m in L.A. and can’t traipse NYC to snap pics of his recent works, I’ve been quietly following him for 3 weeks on Instagram. Since day one I’ve seen and heard a lot of on-line angst over his “residency”. Hating on Banksy quickly became as clichéd as the swarming crowds taking pictures of his work. And herein lies the problem I have with this whole phenomenon. The “fans” and the “haters”. 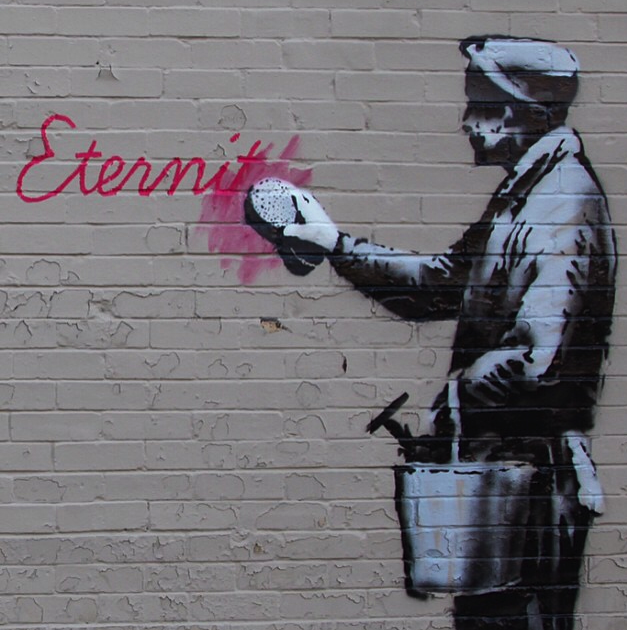 Most fans have been lining up to take pictures, while others are determined to claim “firsties” to vandalize his work, and many a hater has taken to social media to complain about Banksy at every possible opportunity. Each new piece turns into a picture snapping, vandalizing, plexiglass protecting circus. Meanwhile, lurking in the near distance are the profit mongers-the building owners and other random parasites looking to cash in on their fortuitous predicament of being vandalized by one of the greats of street art. Yesterday’s piece (a pretty cool Sphinx like rock formation located in a sketchy biohazard-riddled street puddle in Queens) was at the center of another greed-filled controversy. The internet was abuzz when a random individual claimed squatters rights on the piece and allegedly began to offer up pieces of the sculpture for sale at $100 each. The minute I heard this story it became clear to me that as much as we want to think of Banksy’s NYC residency as a self-aggrandizing, promotional media stunt, it’s too easy to dismiss it as such. The sad byproduct of all of this is how reactions quickly went from curious to opportunistic. Yet, just when I’m resolved to view this current Banksy phenomenon through my misanthropic lens, I can’t help but think about what Banksy’s work has done to engage the city. People are “talking.” Whether you love Banksy or hate him, defend street art or rail against it, there’s a conversation. Even critics like Jerry Saltz are getting into it and getting the dialog going. Perhaps this isn’t so bad after all? Tell that to the NYPD.